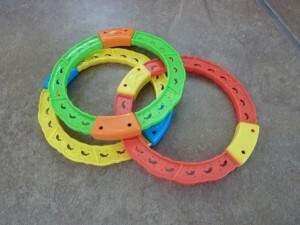 She had posted about using a plunger for ring stacking and when I was at Target, I found these dive rings in the dollar section (I also grabbed an inexpensive new plunger. 🙂 ). 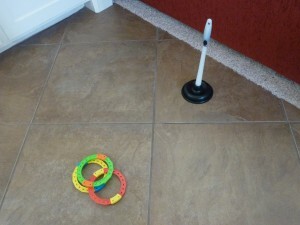 While the dive rings are meant to go into a pool, combined with a plunger, they make a fun, super inexpensive, summer themed ring tossing game! 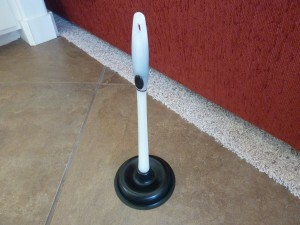 This is a great way to work on tossing, motor planning, and can be set up almost anywhere you have a flat surface to suction the plunger to! 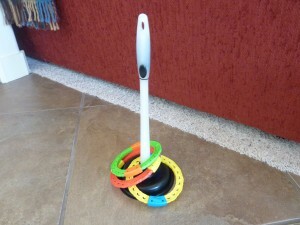 We will start as close as we need to get the idea of how to toss, how hard, etc. and move back slowly to build this skill. Finger placement, hand/wrist movement and timing the release of the ring are all necessary for this activity. Having just tried a game of horseshoes with him, which is similar, we will probably be standing pretty close for a while and that is okay! I want him to get a chance to experiment, see what happens when he tries different approaches and work on the motor planning of this as much as he needs. We did this in front of a couch and it worked well for stopping some of the more “enthusiastic” tosses :).